With more than 800 miles of hiking trails meandering through Great Smoky Mountains National Park, you’ll never run out of well-marked, wooded pathways to explore. Stop by one of the visitor centers for a trail map and tips. You don’t have to be ready for the Tour de France to enjoy biking in and around Gatlinburg. One favorite spot for cylists: the scenic 11-mile Cades Cove loop, where wildlife and wildflowers form an unforgettable backdrop. More than 240 species of birds, including some rare and endangered species, call our corner of the world home. Look for feathered friends in the spruce fir forests and open fields of Great Smoky Mountains National Park. Head to Gatlinburg for top-notch Tennessee trout fishing. Local guides and full-service fishing outfitters can supply everything you need to reel in a prize catch. 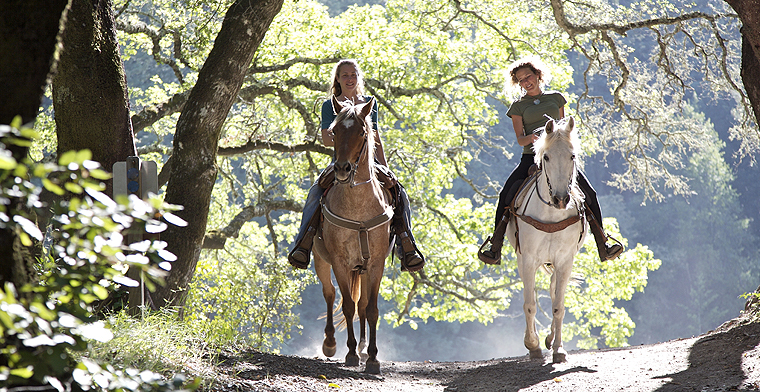 Guided horseback riding treks showcase the Smokies in a whole new light. Stop by Smoky Mountain Stables and Sugarlands Riding Stables for details on scenic wilderness rides you’ll never forget. Sharpen your golf swing at two 18-hole courses in Gatlinburg. With their mountainous terrain and rolling hills, the Gatlinburg Golf Course and Bent Creek Golf Course challenge beginners and more experienced golfers. For an adrenaline rush like no other, plan a wild ride on the Big Pigeon River, where Class III and Class IV rapids create unforgettable memories. For a more laid-back adventure, opt for the river’s lower sections, where you can float along at a leisurely pace. Ziplining is high on our list of Smoky Mountain adventures. Buckle in and prepare to be wowed by the natural beauty beneath you.